Thirty-three members of the Amsterdam architect's group De 8 spent ten years working on the urban plan for a village of 300 dwellings and some facilities. Nagele is one of the satellite villages surrounding Emmeloord, a town in Noordoostpolder, the Zuiderzee Works' first large area of reclaimed land. The commission for Emmeloord, like most major commissions during the first decade following the Second World War, went to the traditionalist architects of the Delft School. Nagele was one of the few chances open to 'moderns' of putting their ideas into practice on a larger scale than usual. Though Nagele was indeed a genuine collective design and was signed as such by De 8 it was based for a large part on sketches by Rietveld. 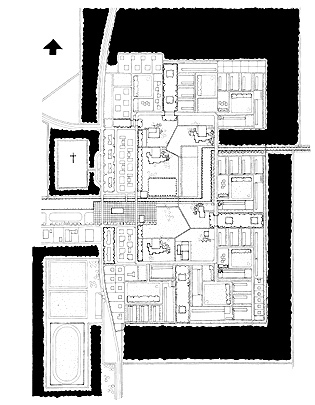 These were elaborated by the young architects Kamerling and Van Eyck (under Van Eesteren's supervision) into the definitive urban plan. The village consists of a green heart with communal facilities, closed in on three sides by seven 'wooneenheden' (clusters, see also Pendrecht) separated from each other by narrow green zones. Lining the fourth side are shops, a cemetery and sports facilities. Broad rows of trees protect the village from the polder winds. Like the urban plan, many of the individual houses and other buildings were designed collectively.